Gusher's Gold Video Slot Review - Casino Answers! Gusher’s Gold is a 5-reel, 20-line video slot developed by Rival Gaming, featuring expanding wilds, multipliers, a free spins feature, a jackpot feature and a bonus game. You can play the Gusher’s Gold video slot at Bovada. The Gusher’s Gold casino game is a penny slot. Coin sizes on the Gusher’s Gold slot machine are $0.01, $0.05 and $0.10. You can select 1-20 lines at 1-10 coins per payline. The maximum total bet possible on the Gusher’s Gold fruit machine is $20 per spin. The betting range isn’t too high on Gusher’s Gold, but it should suit most casual players looking to play a good video slot. To play the Gusher’s Gold video slot, select your bet and press “Spin.” For those looking to play all 20 lines at 10 coins per line, you can use “Bet Max” instead. The jackpot symbol on the Gusher’s Gold video slot is the Oil Baron symbol. 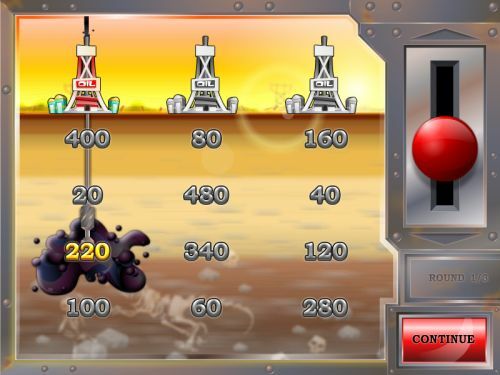 If you hit 5 Oil Baron symbols on a selected payline, you will win the 1000 coin top fixed jackpot. The next highest paying symbol is the Car, which will pay out up to 500 coins if you get 5 of a Kind. When the Oil Drum symbol appears, it will expand to cover the entire reel whenever new wins are possible. It will substitute for all symbols except for scatter symbols. The Oil Drum wild symbol only appears on reels 1, 3 and 5. A unique feature on the Gusher’s Gold slot game is the Oil Pump Jackpot. The Oil Pump Jackpot can activate randomly after a spin. If it reaches the top of the jackpot meter, you will win coins. Win cash from this special feature on Gusher’s Gold at Bovada! You can win free spins in Gusher’s Gold when three or more Miss America symbols appear anywhere on the reels. When 3, 4 or 5 Miss America symbols show up, you will win 5, 10 or 20 free spins at a 3X multiplier. The free spins feature will be played at the lines and bet of the triggering spin, so make sure you play all 20 lines when you play Gusher’s Gold. Symbols must be displayed on active payline to win. Symbols must appear consecutively beginning on the leftmost reel. Payouts will be determined by how many matching symbols appear on a payline. All wins pay left to right, except for scatters (which pay any). All wins are multiplied by the bet per line. Only the highest win is paid per selected payline. Gusher’s Gold has an autoplay feature that is available for real money players only. To access it, press the “Auto” button. There are advanced settings available on the Gusher’s Gold autoplay mode. You can play from 1-500 autoplay spins, stop when your balance increases/decreases by $1-1000, stop on any win and set a delay between spins of 0-10. You can stop the autoplay mode on the Gusher’s Gold video slot at any time by pressing the “Stop” button. Gusher’s Gold offers lots of great special features like the expanding wilds, free spins feature, Oil Drum Jackpot and bonus game. The top payout isn’t too great, but it’s made up for in spades by the rest of the video slot features. To play the Gusher’s Gold video slot, sign up and make a deposit today at Bovada! Can players residing in the USA play the Gushers Gold online slot machine for real money? Yes, players who are based in the United States of America can play the Gushers Gold slot game. You can play Gushers Gold at USA-friendly Rival-powered online casinos such as Bovada. Can I play a free flash game of the Gushers Gold video slot? 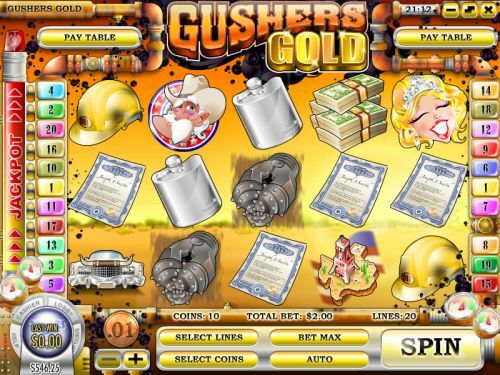 Unfortunately, at present time, the Gushers Gold free flash game has not yet been added to Rival flash casinos. However, we do expect to see it up there soon and available for you to play for free or real money within the confines of your internet browser.